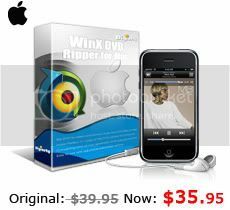 WinX DVD Ripper from digiarty softwar for Mac OS is given as free giveaway starting from April 15, 2010 which will last 12:00 AM GMT May 1st, 2010. WinX DVD Ripper which is desgined to make perfect DVD 1;1 DDV copy to HD drive an rip DVD movies on Mac OS to iTunes, Mov, Flv, Mp4 etc. format compatible on iPad, iPod, iPhone, Apple-TV, PSP and much more. Most important, it enables users to rip DVDs of new generation copy protections with the fastest speed.